Watch racing and performances from a team of trained riders with 32 extraordinary horses. 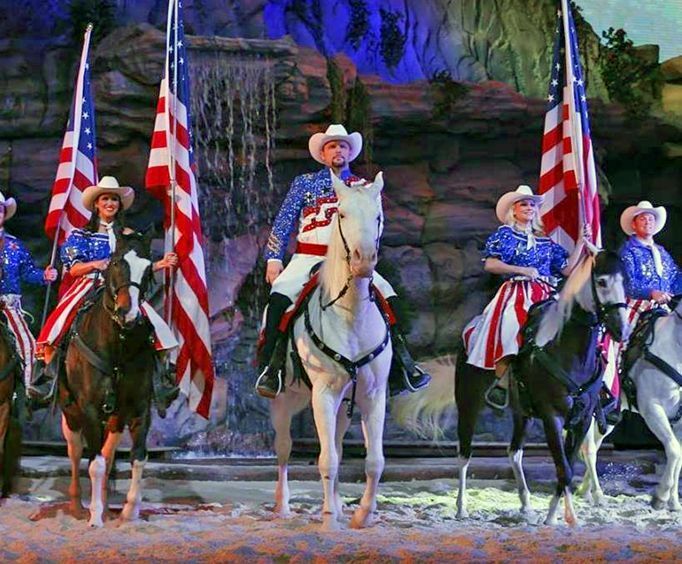 Watch riders compete in challenges, such as barrel racing and carriage racing, surrounded by the show's world-famous ostriches. This package also includes the Branson Titanic. The show lasts approximately two hours, and your ticket also includes a seat with a great view, dinner, and pre-show entertainment. This show is family friendly and a wonder for all who attend it. Children and adults alike love the exotic ostrich racing and the amazing horse tricks. Bring your family to the Stampede and watch these trained riders race these gorgeous ostriches around the arena. With 1,100 seats in the 35,000-square foot arena, you are assured to have an amazing view so you don't miss a thing, even if you're eating. There are also a number of other fantastic attractions in the area to visit during your stay. Finally, top off your vacation with a visit to the Titanic museum. The movie based on this tragedy is known as one of the most romantic films of all time, so learn about the true events of that night with your loved one to gain a new perspective on the journeys of the passengers and crew.